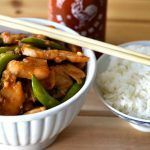 This spicy Asian chicken stir fry has a delicious sweet and spicy sauce made from a blend of sriracha, soy sauce, honey, garlic, and ginger. An easy recipe that’s a hit with the whole family! It’s been a while since I’ve shared a great dinner recipe, and, well, it’s because I’ve made some FLOPS over the past few weeks. (Or, as my family so kindly called them, “slops.”) Let’s just say that I was in experimental mode, and some of my experiments didn’t turn out nearly as well as I envisioned them in my head. 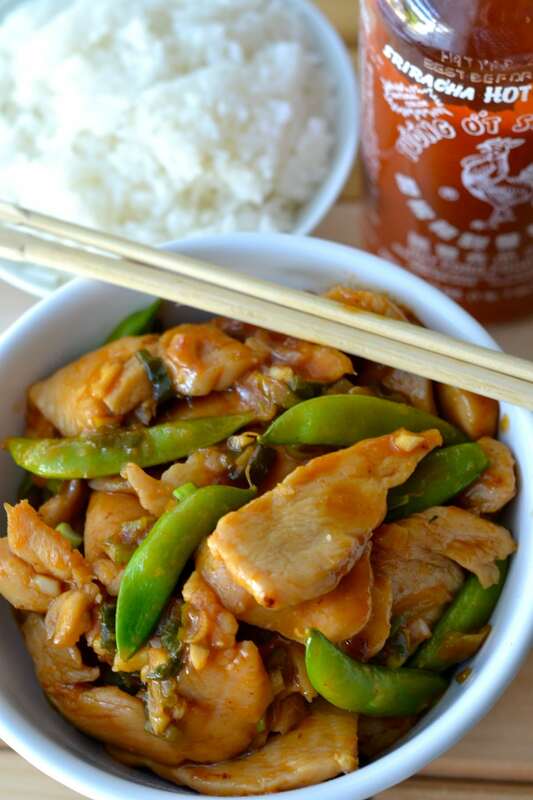 Now, onto the good stuff — this Spicy Asian Chicken Stir Fry! This recipe is so good, it made up for my flops ten times over. The secret to its success is the texture of the chicken and the AMAZING stir fry sauce that combines honey and sriracha for that perfect sweet and spicy flavor balance. I almost licked the bowl, and my daughter requested to eat the stir fry leftovers the next day immediately after getting home from school. For spicy Asian chicken to beat out Girl Scout cookies for a snack, you know it has to be good! Have you ever noticed how the chicken you get in Chinese restaurants has a unique texture? It’s usually really thin and tender, and doesn’t have that chewy factor that home-cooked chicken sometimes has. Well, it’s due to a technique called velveting. It might sound fancy and exotic, but it is truly the easiest thing ever, especially if you use the velveting technique I learned from Nagi, food blogger extraordinaire over at RecipeTin Eats. I’ve read a few different techniques for velveting chicken over the years, but when I saw how simple Nagi’s technique was, I was sold. All you have to do is combine your sliced chicken with some baking soda, let it sit for 15 minutes, and then rinse it off. THAT’S IT!! This easy step will give your chicken that “Chinese take-out” texture, and make you feel like an Asian cooking rockstar. I can’t take credit for inventing the sauce. It came from an old recipe I tore out of “All You” Magazine a few years ago. But I did work on simplifying their original recipe to cut down on the number of steps needed without sacrificing any of the deliciousness. You can use any vegetable you like in this chicken stir fry, but I chose sugar snap peas because they cook up so quickly without any blanching or pre-cooking required. If you’re not a fan of snap peas, you could always substitute broccoli or another vegetable, but you may need to pre-cook it a little bit in boiling water or the microwave to make sure it reaches its desired tenderness in the saute pan without starting to burn. One thing I’ve never liked about making stir fry is having to cook different components at different times to make sure everything is cooked perfectly and comes together at the same time. In this easy stir fry recipe, everything except the chicken and sauce gets thrown into the pan at once, so it’s completely fool-proof. After you’ve velveted your chicken, chopped your veggies, and combined your stir fry sauce ingredients, you’ll only be spending 10 minutes of actual cooking time at the stove. 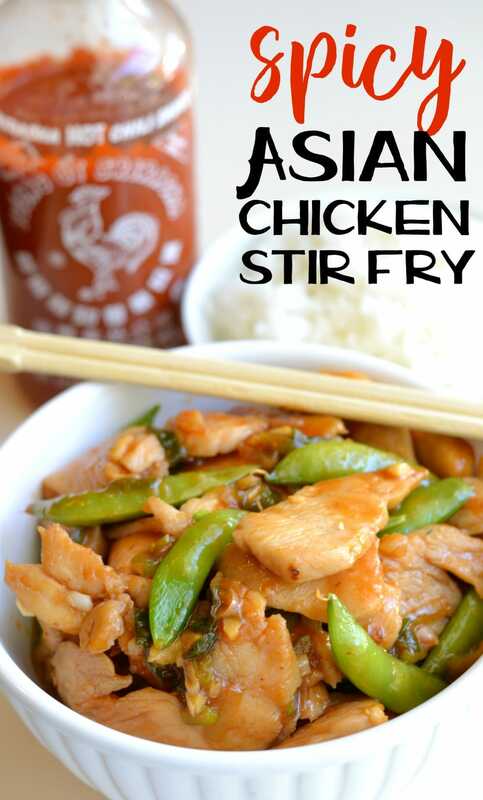 This easy Asian chicken stir fry has an addicting sriracha sauce and "velveted" restaurant style chicken. You'll never want to order take-out again! 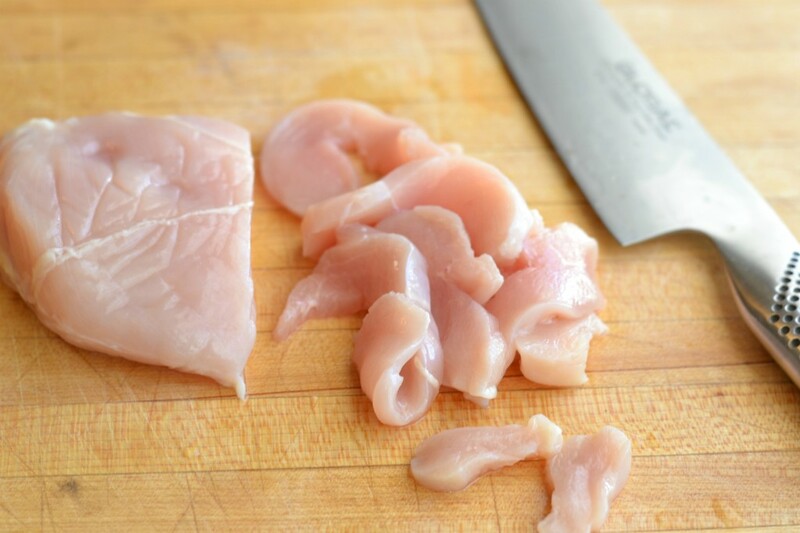 To velvet the chicken: Thinly slice the chicken breast and cut slices in half to create pieces about 1.5-2 inches in diameter. 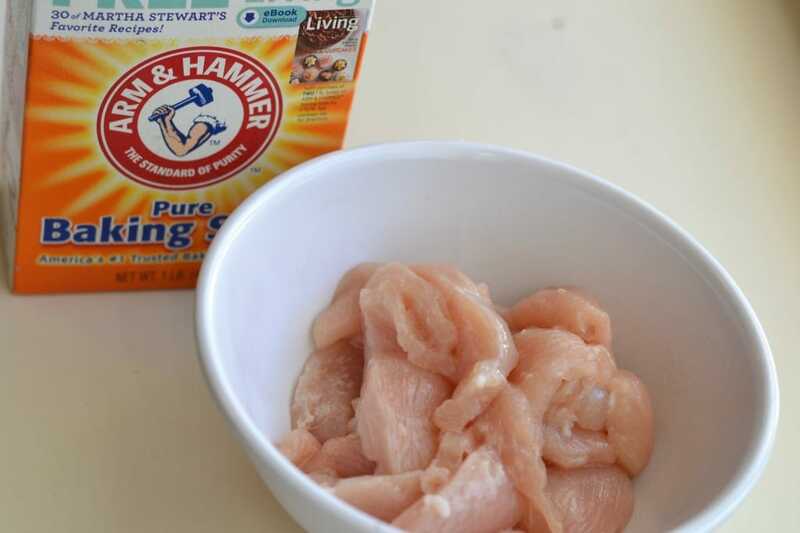 In a bowl, toss the chicken with 1 tbsp baking soda. Set aside for 15 minutes. After 15 minutes, rinse thoroughly in a colander and pat dry. 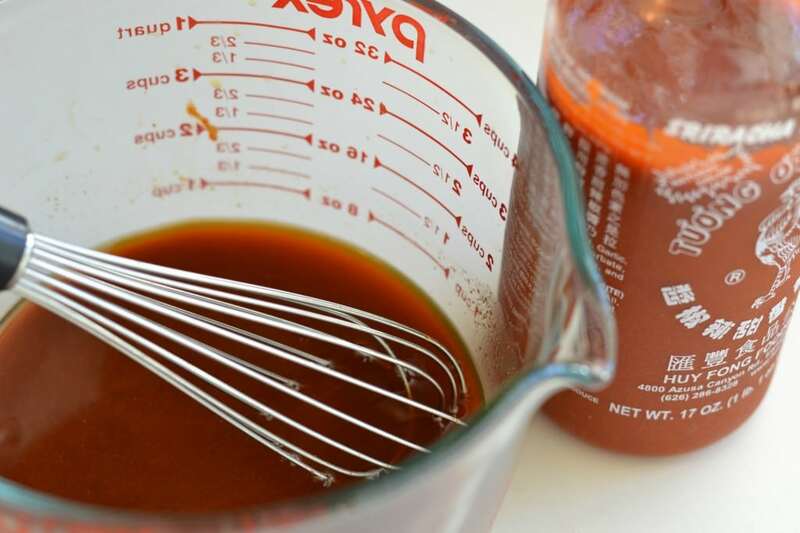 In a separate bowl, whisk together the chicken broth, honey, sriracha, soy sauce, rice vinegar, and cornstarch. Combine the chopped garlic, ginger, snap peas and scallions in a bowl. In a large skillet or wok, warm 2 tbsp canola oil over med-high heat. Add the chicken and a splash or two of the sauce. Stir-fry until chicken is cooked through (no longer pink). Remove the chicken to a plate. Add 1 more tbsp of oil to the pan and pour in the snap peas, garlic, ginger, and scallions. Cook for about 3-4 minutes or until snap peas are tender, but still crisp. Return the chicken to the pan, and add the remaining sauce. Cook and stir until sauce thickens (about 4 minutes). Serve over white rice. 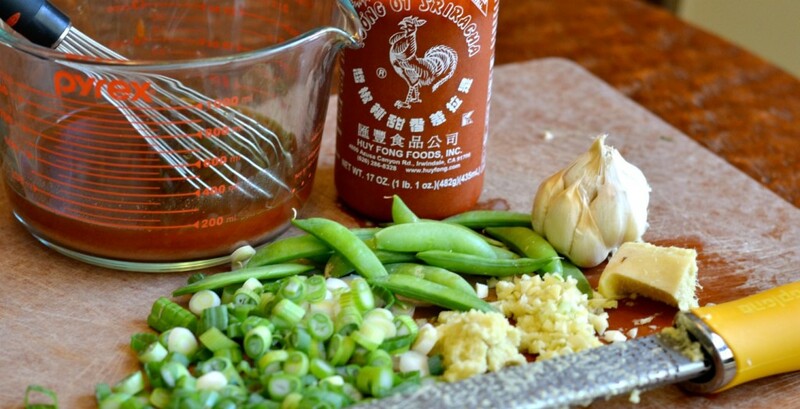 For less heat, reduce the sriracha to 1 tbsp. Have you tried this recipe? If so, please leave a comment and let me know what you think! Before you go, be sure to check out my homepage for my MOST RECENT POSTS, my full RECIPE INDEX for more easy recipes. I made this tonight and it was delicious. The bi-carb (baking Soda) gave the tenderest chicken I’ve ever made. Thank you for the recipe and the tip. I only used 1 tblspn of the sriracha and it was tasty without overwhelming the taste buds. Next time I’ll be brave and double it. Made this recipe pretty much as it was written. I tripled it. My 28 year old son said it was in the top ten of anything I’ve ever made!